As the public disquiet and international storm caused by the mistreatment of an 7-year old child by the ‘Republic’ of Ireland grows, Vera Twomey walks on. She’s walking in hail, rain, and sleet. She’s walking to get medicinal cannabis for her daughter Ava, who has Dravet Syndrome. She’s walking powered by a Mum’s determination to do what’s right for her child. She has the full support of her family, and everyone she meets on her 200+Km walk in the cold of an Irish Spring. Everyone, that is, except the two Government ministers who should be supporting her at every turn. Those are the Minister for Health (Simon Harris), and the Minister for Children and Youth Affairs (Katherine Zappone). Neither have lifted a finger to help. Today’s continued walk was from Littleton in County Tipperary to Johnstown, County Kilkenny. Which means that Vera has now walked 138Km for her child. Children from the local National School in Littleton walked in support of Ava and Vera for the first kilometre of the day’s journey. Along the way she was joined by some public representatives who recognise the increasing public disquiet caused by the extraordinary undertaking of this woman. Vera was also joined by increasing numbers of ordinary citizens who wish to show their solidarity with her. At all times Vera is accompanied by Gino Kenny TD, who has assisted her throughout her ordeal, and who has proposed legislation that could resolve the issue. Vera was also joined today by Ming Flanagan. There continues to be general silence from the Minister for Health on her request for help. On his statements in the Dáil (the parliament of the ‘Republic’ of Ireland), there is discussion on the correctness of the content, and the impression given by them. Tomorrow Vera starts from Cullahill in County Kilkenny. In order to reach Dublin by Tuesday, a decision was made to start from that point in order to get to Portlaoise on Saturday; Portlaoise is home to Ireland’s largest prison. 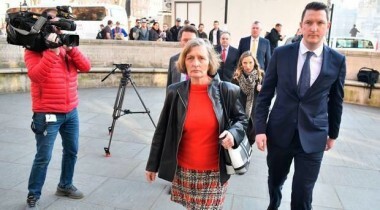 That’s the prison to which Vera or her husband Paul could certainly be sent by the State if either of them did what any right-thinking parent would do, and themselves arranged medicinal cannabis to control their daughters seizures. What Vera wants for 7-year old Ava is perfectly safe, legal, and acceptable in other European states, and on most of the continent of North America and Canada! Can you come along, take photographs, and share them to *everyone* in your Facebook to raise awareness of what this Mum must do for her child in the face of an uncaring State? Can you share this link or page to others around our planet? Can you do your bit to draw international attention to the shameful conduct of the Southern ‘Republic’ towards one of it’s youngest citizens? Can you be like the children of Littleton National School and do your part to help a sick 7-year old child? Or can you send an email to simon.harris@oir.ie to point out how disappointed you are that he has so far not heeded the request of a Mum who just wants her child to be well? If you’ve already sent an email, then thank you; but have you received a reply? If not… send again and ask why not. Please. It’s Vera’s concern that if Ava has another major seizure that there could be further permanent damage, or death, as a result. Your clicks and email will help. “The McGurk families were very welcome to the Oireachtas today. “Their accounts of the massacre of their loved ones in December 1971 and the treatment of the atrocity by the British government of the time and successive British governments is appalling. “Fifteen people, including two children, died in the outrage. “Within hours of the massacre the British government deliberately spread lies that the IRA was responsible for the bombing and that those who died were also involved despite the fact that an eye-witness gave RTE an interview, which was broadcast saying he saw the bombers fleeing the scene. “These lies were based on reports from the British Army and the RUC that were willingly accepted and promoted by the British and unionist governments. “A British Army scenes-of-crime assessor submitted a report to the British Army Headquarters in which he stated that the bomb was placed in the entrance to the bar. “This contradicted the public account by the British government and the soldiers report was marked ‘Not for PR’. “The lie was publicly supported by Reginal Maudling, British cabinet minister, Brian Faulkner, the North’s prime minister, John Taylor, unionist cabinet minister, Graham Shillington, RUC Chief Constable and Sir Harry Tuzo, British Army GOC among many others. “The lie continued for decades until the families uncovered the truth themselves from the British government’s own files in Kew Gardens. “The Historical Enquiries Team (HET) and the police Ombudsman failed to find these files. “The families are seeking justice and the truth. “I support the calls they made today for a new investigation, a new inquest and the scrapping of the HET report into the massacre. Sinn Féin TDs Jonathan O’Brien and Pearse Doherty have today published a Bill which seeks to reduce the costs of Tribunals of Inquiry including the one set up last week to look into the alleged smear campaign against Garda Whistleblower Maurice McCabe. “The government has established a Tribunal of Inquiry rather than a Commission of Investigation into the alleged smear campaign against Garda Whistleblower Maurice McCabe. “This is a decision that we welcome and last Thursday the Dáil passed the extended terms of reference for the Tribunal of Inquiry without opposition. “While there was no opposition to the terms of reference, a number of Deputies raised the potential cost of a Tribunal given recent experiences with other Tribunals. “While the Minister gave a commitment to examine whether that legislation could be progressed, Pearse Doherty and I have today published our own Bill, the Tribunal of Inquiry (Evidence) Bill 2017, which would address the issues of costs. “We have submitted it to the Ceann Chomhairle today seeking leave to introduce it as soon as possible. “We are hopeful that the Government will accept the Bill and allow its speedy passage through the Dail. Sinn Féin President, Gerry Adams TD, today raised the Pat Finucane case with Taoiseach Enda Kenny in the Dáil. 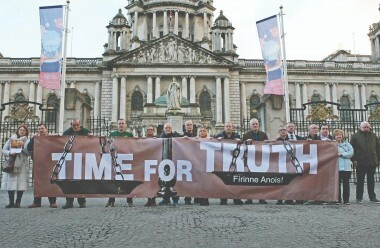 He did so after the Court of Appeal in Belfast dismissed the appeal by the Finucane family against the refusal of the British government to honour its commitment on a Public Inquiry. Speaking to the Taoiseach Gerry Adams called on the Irish government to bring the Finucane case before the United Nations, the European Union, the government of the United States and to every other available international forum. “I have to ask the Taoiseach what the government has done to implement the Weston Park agreement between the British and Irish governments in 2001? “This committed both governments to hold inquiries if a judge appointed to examine these cases recommended this. Judge Peter Cory concluded that four inquiries should be held. Three have taken place. But the British government has refused to hold an inquiry into the murder of human rights lawyer Pat Finucane! · Agents working for MI5, RUC Special Branch and British Military Intelligence were participating in criminality, including murder. · This issue was also considered extensively at British cabinet level and ministers were aware that the agents were being run without guidelines. The director general of the MI5 briefed Margaret Thatcher in 1988. “Pat Finucane’s murder by state agents was not a one-off incident – it was the norm. 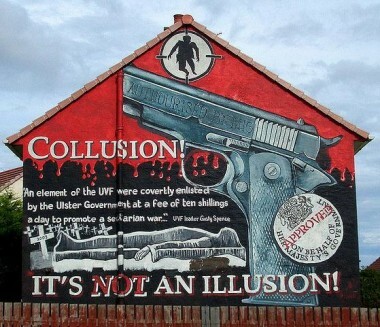 Collusion was a matter of institutional and administrative practise by successive British governments. It involved the establishing of unionist paramilitary groups, the systematic infiltration by the British of all unionist death squads at the highest levels, the controlling and directing of these groups, their training and providing them with information on people to be killed. Of late, considerable coverage has been devoted to Martin McGuinness’ nomination for the Tipperary Peace Prize, most notably in the Tipperary Star, which was headlined with “ANGER MOUNTS” on its front page, as well as to referring to the supposed ‘outrage’ of McGuinness being nominated for such an award. John Kerry (previous recipient of Tipperary Peace Prize) with RPG (rocket propelled grenade) during the Vietnam War. To contend that McGuinness is ‘unfit’ to be recognised for his extraordinary peace-building endeavours in the North of Ireland on account of his involvement in the IRA is quite simply ridiculous and utterly obtuse. Such critics would do well to note that last year’s recipient, was former US Secretary of State John Kerry. In addition to his tenure in that office which is difficult to describe as being either ‘pro-peace’ or ‘non-confrontational’, Mr Kerry was a combatant in the criminally destructive Vietnam War. Though in the later stages of the Vietnam War John Kerry would receive acclaim – and deservingly so – as an anti-war whisteblower, it does not negate the fact that he was the captain of a boat unit that was engaged in an operation renowned for its aggression and cruelty towards Vietnamese villagers and fishermen. Nonetheless, Kerry’s Tipperary Peace Prize Award was presented with not so much as an iota of disquiet or opposition; that silence in comparison with hypocritical the response to Martin McGuinness’ recent nomination. Martin McGuinness attends the funeral of a Republican Volunteer. Martin McGuinness’ nomination for this award makes sense and is completely deserved. As a leader of the Republican movement, Martin has achieved breath-taking results in working towards peace and justice in an fraught political environment; this is a state of peace which, for whatever its flaws, is substantial, too often taken for granted, and once thought impossible. 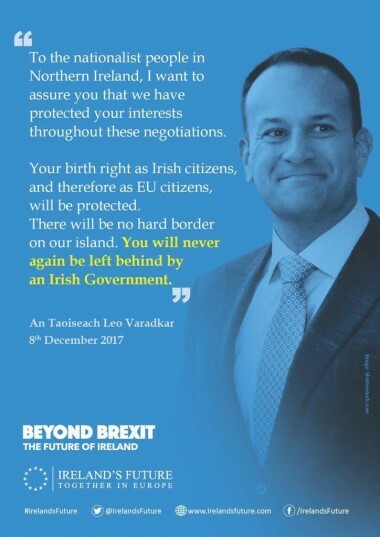 Martin and Sinn Féin have worked tirelessly and always in good faith towards making this process permanent in spite of the disrespect too often afforded to them by other actors, whether that be the current contempt and chauvinism demonstrated by the Tory Brexiteers, the arrogance of bull-headed unionists or the habitual negligence of the Dublin government and its institutions. Martin McGuinness with other known equality and peace activist, Nelson Mandela. What’s more, it is not like Martin’s co-nominees are without controversy themselves. Amal Clooney, Amnesty International and the ‘White Helmets’ civil defence organisation occupy a very partisan position on the Syrian conflict. They explicitly lobby for a forceful international military intervention against the Syrian government. The White Helmets in particular have attracted especial notoriety for its dubious overlap with anti-government militias; that undermines its ostensible position as a politically neutral and civil humanitarian organisation. It must also be stated that it is disappointing that the ongoing peace process in Colombia has received virtually no recognition from the Tipperary Peace Convention in contrast to the preponderance of attention focused on Syria. In one of the world’s longest ongoing conflicts – stretching five decades – Colombia is on the brink of attaining a concrete and lasting peace. In a country that is seen as one of the most dangerous places in the world to be a trade unionist or human rights activist, this is an not an opportunity that can be let slip. Martin McGuinness has done business with every leader from the Unionist community, even those who would not naturally be courteous towards him. Sinn Féin have worked closely with the FARC rebel group to offer their extensive and long-standing experience in conflict resolution, and President Michael D. Higgins has also shown commendable and progressive statesmanship recently, when he visited Colombia. In so doing, he became the first European head of state to visit a FARC guerrilla detachment at a demobilisation camp. These traits of leadership, dialogue and reconciliation are principles that Martin McGuinness has demonstrated consistently; to obscure them is disingenuous. To deny them outright is dishonest. From: Sinn Féin Republican Youth Tipperary, Chairperson James Lyons. Sinn Féin President, Gerry Adams TD, today raised the Pat Finucane case with the Taoiseach in the Dáil and calls on the Taoiseach to initiate a diplomatic offensive to get the British government to honour its obligations and commitments. This morning the Belfast High Court dismissed the appeal of Geraldine Finucane against the British government for its refusal to hold the promised inquiry into his murder in February 1989. The family have been involved in a long battle with the British state over the circumstances of Pat Finucane’s death and the role of the British state and of its agents in carrying out that murder. “I trust you noted that the Court of Appeal in Belfast has dismissed the appeal of Geraldine Finucane. “It did so on the basis that Ministers are entitled to depart from the policies of previous governments. “I want to commend the courage and determination of Geraldine Finucane and the Finucane family for pursuing this case through the courts. 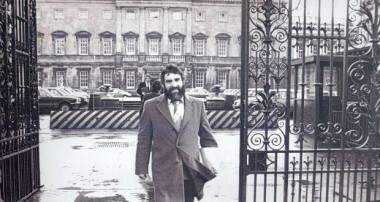 “At Weston Park in 2001, the British and Irish Governments agreed to invite Judge Peter Cory to examine four cases, including that of Pat Finucane. Judge Cory concluded that four inquiries should be held. Three have taken place, including one by the Irish Government. However, the British Government has refused to honour its commitment. “In October 2011, the British Prime Minister David Cameron further disappointed the Finucane family by refusing an inquiry and instead appointing Desmond de Silva to review the case files. The de Silva report was published in December 2012 and it revealed a shocking scale of collusion by the British and Unionist paramilitaries. 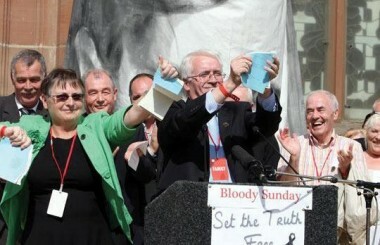 It serves to reinforce the need for an inquiry into the killing of Pat Finucane. Sinn Féin Party leader and Louth TD, Gerry Adams, has urged the government to resolve urgently the crisis around the provision of the cystic fibrosis drugs, Orkambi and Kalydeco. A major demonstration is being planned for next Wednesday March 1st outside the Dáil. “Before Christmas Oireachtas members heard distressing first-hand accounts of CF sufferers and their families. Orkambi and Kalydeco can save lives. They can dramatically improve the well-being of hundreds of patients. “At the beginning of February media reports suggested that HSE drug committee had not recommended the use of the drug Orkambi for more than 550 Irish CF sufferers. “Today, I raised the availability of Orkambi with the Taoiseach. His response was deeply disappointing and failed to clarify the current state of discussions between the HSE and the drug company Vertex. “New evidence has now emerged to support the case for approving Orkambi. According to Cystic Fibrosis Ireland this new data shows Orkambi will save the health system even more than was previously estimated.